The Rev. Ellen L. Tillotson, Class of 1983 and a member of our Board of Trustees, is the Interim Priest in Charge of Saint Luke’s Episcopal Church, Darien, CT. She most recently served as Missional Priest at St. John’s Episcopal Church, Bristol, CT.
Tillotson was the Rector of Trinity Torrington, CT from 1992 – 2011. She has also previously served at Trinity Church on the Green, New Haven and as a Supply Priest and Church Consultant for the Episcopal Diocese of Connecticut. A native of North Dakota, Tillotson earned her Bachelor’s Degree from the University of North Dakota before attending General. She received her Master of Sacred Theology from Yale Divinity School in 2014. Tillotson is married to the Rev. William Cavanaugh, Class of 1981 and a member of our Alumni Executive Committee. The Rev. James Robertson, Class of 2012, will be ordained to the priesthood in the Diocese of Central Pennsylvania on June 15, 2019. Robertson had experienced a failed process toward ordination in the Diocese of Pennsylvania. He was encouraged by colleagues to return to the diocese in which he had grown up, which was smaller, and where he would get more personal attention and mentoring as he discerned his next steps. In 2015, he was accepted into the process in the Diocese of West Missouri (Kansas City), after a "getting to know people and place" time. He was on staff at Grace and Holy Trinity Cathedral during that time beginning in 2014. In the Spring of 2018, Robertson and his husband Dean Ennis’s family obligations necessitated a move back east. Bishop Scanlon of the Diocese of Central Pennsylvania, together with the Commission on Ministry and Standing Committee, accepted Jim's candidacy for priesthood in order that he not have to begin the process over after their move. After arriving in the Diocese of Central PA, Robertson conducted extensive visitation throughout its 61 parishes. Click here for the ordination invitation. James K. "Jack" Murray, Jr., died February 15, 2019. He was a member of our Board of Trustees from 2011 until his death at age 83. Mr. Murray was a long-time member of St. John's Episcopal Parish in Tampa, Florida, led by the Rev. Charles "Chip" Connelly, Class of 2007. Born June 3, 1935, Murray was a proud member of two large families of coal miners: the Murray family of Pocahontas, Virginia and the Kenyon family of Osage, West Virginia. Jack was born on June 3, 1935 in Elm Grove, West Virginia. His parents were James K. Murray and Edith Kenyon Murray. Mr. Murray was the husband of Sandra High Murray. He was blessed with a wonderful wife. They were married on June 14, 1958 in Charleston, West Virginia and they visited Florida on their honeymoon and decided to stay in the Tampa Bay area. He was the devoted father of Susan Murray, of Pinellas Park, FL, James K. "Jack" Murray Ill (Mary), Michael S. Murray (Allison) and Scott Lee (Erika), all of Tampa, Florida. And the proud grandfather of Sarah Ragsdale Shanklin (Billy) and Charlie Ragsdale of St. Petersburg, FL, Ashton Murray of New York, NY, Jack Murray IV, Kaitlin and Cody Murray of Tampa, FL, Jennifer Murray Kent (Tommy) of Burke, VA and Mike Murray, Jr. of New Zealand. Mr. Murray was the delighted great-grandfather of Delilah Shanklin, Jackson Lee, Adeline Lee, and Allison Kent. During his long life, Mr. Murray had the joy of being in business with an outstanding group of partners and colleagues. And he was blessed with a wonderful group of friends. Following the Murray family tradition, there was a private service for immediate family members only, led by the Rev. Charles "Chip" Connelly, and a later internment of the ashes at the Murray family cemetery in Charlottesville, Virginia. Marge Christie, General Seminary Trustee from 2001 – 2012 and 13-time deputy to General Convention from the Diocese of Newark, died peacefully in her sleep, April 13, 2019 at the age of 90. Marge was part of that generation of women leaders in the church - which included women like Marge Burke, Pam Chinnis, and Sallee Buckley - who worked tirelessly for the ordination of women who, themselves, were not called to ordination but, rather to an empowered ministry of the laity. Marge served tirelessly as a member of Executive Council, the Executive Council and UN Commission on the Status of Women, The Episcopal Church Women, was among one of the first members of the Episcopal Women's Caucus and founder of The Anglican Women's Empowerment. 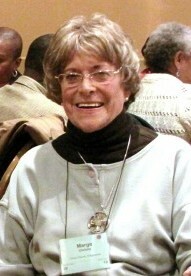 Deeply committed to diversity and inclusion, Marge was a founding member of The Oasis (DioNewark LGBTQ Ministry), the DioNewark Dismantling Racism Commission which successfully passed a diocesan resolution which mandated Anti-Racism Training as a requirement to election to any diocesan office, and the DioNewark Women's Commission which successfully passed a resolution requiring all diocesan worship services to use inclusive/expansive language. Even more importantly, Marge was involved in the spiritual formation of many, many women to the diaconate, priesthood, and episcopacy. At her last Diocesan Convention, she was elected first alternate for the Diocese of Newark beside her granddaughter, Caroline Christie, elected deputy at age 17. They had just spent two weeks together as roommates as part of an Anglican women’s delegation to the annual United Nations Commission on the Status of Women in New York. She was a Giant of Justice. We who were privileged to stand on her shoulders will be forever and eternally grateful that she helped us reach for the stars and dare to bring glimpses of the Realm of God into the church. Click here to read the tribute from the Diocese of Newark. Click here to read the obituary at Episcopal News Service. The Rev. Nathan Ritter, Class of 2010, has been named new Pastor and Priest-in-Charge at Calvary Episcopal Church, Flemington, NJ. He has previously served at Grace Church in Newark, St. Paul’s Westfield, and Saint Thomas Church in New York City. Ritter, who was born in St. Louis, graduated from Truman State University with a B.A. in classical languages and a minor in religious studies. From there, he moved to New Haven, Connecticut, where he earned a master’s degree from the Yale Divinity School. While at Yale, he focused on the Old Testament and Semitic languages and studied Aramaic, (Syriac), Ethiopic, Hebrew, Akkadian, Ugaritic, Sumerian and Greek. During his time in New Haven, he also met his future wife, Jessica, and officially became an Episcopalian when he was confirmed at Christ Church. From there, Ritter entered the graduate program in Assyriology at the University of Michigan to study the languages and cultures of ancient Iraq and Syria. In Ann Arbor, he was active at Canterbury House, the Episcopal Student Center at the University of Michigan. In Michigan, Ritter also went to St. Gregory’s Abbey, an Episcopal monastery in Three Rivers. While serving on a discernment committee for another student, he discerned a call to the priesthood. The Ritters moved to Jersey City in 2007, where Jess was ordained in the Lutheran Church; she serves as pastor of St. Paul’s Evangelical Lutheran Church in Jersey City. As of the end of the first quarter, the TryTank has 16 experiments in different stages: 4 are in active mode, meaning that they are operating and we are gathering data to gauge the success or failure of the individual experiment; the remaining 12 experiments are in the development phase to launch at different times. We anticipate that those experiments will go live in April (3 of them), May (5), June (1), September (2), and one in January of 2020. With all of the announced experiments, we anticipate working with some 180 congregations across the country. You can see the full list of experiments on our website (www.TryTank.org), and you can see where we are on any of them each week by subscribing to our newsletter on the same site. Every Monday you'll get an insider's view of our work. As the director of the TryTank, people will often ask me the same questions: how can my church participate in an experiment? and what is the hardest part of an experiment? Let's look at both. Let's begin with the latter: what has been the hardest part. It has not been, as perhaps my nightmares told me, that we'd have active opposition to our ideas. On the contrary, people have been very welcoming of a new "R&D Department" for the church. True, our sphere of influence is small. Those who get our newsletter now are the "early adaptors." They probably have already been doing experiments on their own and are excited by our work. What actually has been hard is finding experiment partners. Not every experiment is the right fit for every location. But even when some show interest, typically only those churches with multiple clergy members have been able to sign up to participate. Church diversity is essential in this work. We are committed to trying every experiment in at least two settings so that we can see the differences that the context have on the outcome. And we want the experiments to be relevant to small and more resourced churches. This leads right into the "how can we participate question." That's easy, just do the contemporary equivalent of raising your hand, sign up. For each experiment, we always announce in the newsletter that we are looking for partners. When we are looking for many, we'll open up a simple online registration form. When we are looking for just a couple, all we ask is that the person hit "reply" and announce their interest. It's that simple. Our wisdom as a TryTank only grows by the more people and congregations who are involved, follow our work, and provide honest feedback. This means we need you to join our efforts. Get our newsletter. Follow the experiments. When the newsletter poses a question you know something about, hit reply and chime in. Share it with others and get them to sign up as well. So, will you join us in this work? The Rev. Tobias S. Haller, BSG, Class of 1997, served as curator for the latest exhibit of Episcopal Church and the Visual Arts, Worship the Lord in the Beauty of Holiness, now live at the ECVA website. Haller retired after 16 years as Vicar at St James Fordham (Bronx NY). While in New York he served in diocesan leadership, at General Convention, and on the Anglican Communion Indaba Reference Group. Now living in Baltimore, he continues to supply and is an associate at Church of the Advent. He is a member of the Brotherhood of Saint Gregory, and a Commander of the Order of St John. He is an iconographer, visual artist, and musician. His publications include The Episcopal Handbook Revised (Church Publishing 2015) and Preparing for a Wedding in the Episcopal Church (Church Publishing 2017). Re-membering God: Human Hope and Divine Desire, also from Church Publishing, appears this spring; it includes chapters on liturgy, art, music, and architecture as human articulations of the Godward quest. Click here to view the Gallery and learn more about the Episcopal Church & Visual Arts. The Most Rev. Martín de Jesús Barahona Pascacio, D.D., D.D. Bishop Barahona outside the Diocesan offices in El Salvador. The Most Rev. Martín de Jesús Barahona Pascacio, Doctor of Divinity honoris causa 2012, died peacefully on 23 March 2019 at the age of 76 on the eve of San Oscar Romero de las Américas’s assassination, where he was a patient in the Hospital at Divina Providencia, San Salvador, steps from the place where Romero was martyred. Bishop Barahona is survived by his wife and two daughters. To a person, Bishop Barahona is remembered for his smile, which he had up to the end of his life. This characteristic smile was the sign of affection and love he had for the Salvadoran people and everyone whom he met. Bishop Barahona was ordained Catholic priest first, and then worked for more than three decades in the Episcopal Church. This January 6th, he observed 50 years of priesthood and 28 March 2019 would have been his 27th anniversary of consecration as Bishop Diocesan of the Episcopal Anglican Church of El Salvador (Iglesia Anglicana Episcopal de El Salvador, IAES, 1992-2015), the first Salvadoran to be consecrated its bishop. He served the diocese, prior to its becoming autonomous (along with four other dioceses) in 1997 when the General Convention voted to form IARCA. Bishop Barahona was also former Archbishop of the Anglican Church of the Region of Central America (Iglesia Anglicana de la Región de Central de América, 2002-2010). Bishop Barahona received an honorary degree of Doctor of Divinity honoris causa from General in May 2012. At the time of his award, Bishop Barahona was recognized for his unwavering witness to full inclusion at all levels in the church locally and internationally, for his ecumenical and interfaith ministries, for his love of people, his courage and his deep faith in God. He always maintained a message of reconciliation, respect and unity. He also held an honorary doctorate from the Church Divinity School of the Pacific in Berkeley, CA. Bishop Barahona grew up in a small, rural, poor northern town that eventually was subsumed by the creation of a major reservoir. He lost his father and two brothers during the civil war. He drew on this background as he engaged with the people of the IAES, and he reminded others that the IAES is committed to working with the poor. Bishop Barahona’s participation in the wide scope of church and national life made him an internationally recognized figure. He was President of the Ecumenical Forum nationwide in connection with the Latin American Council of Churches CLAI (better known as Fe CLAI) and was called in 2007 to represent El Salvador at the Third Conference of Religions for Peace held in Kyoto, Japan, where more than 3000 people and almost 100 different religions gathered. As further sign of his devotion to ecumenism, in his retirement, Bishop Barahona earned a Master’s of Theology from the One Logos Theological Seminary, an ecumenical free seminary. An important ministry of the IAES that Bishop Barahona created and supported is a human rights office. The IAES is the only church in Central America to have such an office, which works with land reclamation, refugees and deportees. Bishop Barahona’s vision and example of compassion and advocacy laid the foundation for this project. Likewise, in 2003, in collaboration with the Episcopal Diocese of Central New York, he founded Misión de los Milagros, a health initiative that continues to this day. Bishop Barahona was co-founder in 2000 of the non-profit organization, Fundación Cristosal. In its early years, Cristosal worked to foster relationships between the IAES and The Episcopal Church. Now it is an internationally-recognized NGO that works with the displaced, and seeks justice in rectifying El Salvador’s past and human rights. Bishop Barahona, in his retirement, served the IAES as its Peace Ambassador, and continued his decades-long involvement with the Salvadoran Chapter of Religions for Peace as its chair. He participated in nation-wide efforts to broker peace between gangs and authorities, and tirelessly worked to instill a culture of peace throughout the country and to ensure a just and dignified life for all. He played an important role in the 1992 peace accords that ended the 12-year civil war. The President of the Republic of El Salvador, with whom he worked as a founding member of the National Council of Security and Citizen Coexistence (Consejo Nacional de Seguridad y Convivencia Ciudadana), noted the bishop’s death. Bishop Barahona long supported full inclusion of LGBTI people in all levels of the church and was a member of the Chicago Consultation. He was the only other primate to participate in the consecration of the Rt. Rev. V. Gene Robinson in 2003. At the time of his death, Bishop Barahona pastored a small group of LGBTI young professionals in a house-church setting they call, “Comunidad Magdala.” As a testimony to the bishop’s pastoral care, the congregation will continue to worship. Likewise, a non-profit foundation, “Fundación Obispo Martín Barahona: Cuidado Pastoral Integral,” is in formation, through which his remarkable ministry of inclusion and justice-making may continue. Private interment and a church-wide Celebration of Bishop Barahona’s Life were held in San Salvador shortly after his death. The Rev. Vernon A. Austin, Jr., Class of 1959 of Collegeville, PA, died March 19, 2019 at the age of 84. He and his wife, Judith (Haubens) Austin, would have celebrated their 55th wedding anniversary on June 6th of this year. Born June 9, 1934, in Trenton, NJ, he was a son of the late Vernon A. Austin, Sr. and Elizabeth (Clarke) Austin. He was a graduate of Hampden-Syndey College in Virginia before earning his Master of Divinity from General. Austin began his ministerial work as a curate at Trinity Episcopal Church in Ambler, PA. He later served as an assistant at St. George’s Episcopal Church in Schenectady, NY, before being called to Christ Church in Herkimer, NY as their Rector. In 1967, he answered the call of Trinity Episcopal Church of Gloversville, NY. He then served St. John’s Episcopal Church in Norristown, PA starting in 1976, and retired in 1996. In addition to his wife, he is survived by two children, Virginia Carol Stellato and her husband, Mark T., of Valley Cottage, NY, and Stephen Michael Austin and his wife, Amber Y., of Lewisburg, PA; and four grandchildren, Martin, Austin, and Marissa Stellato, and Nola Austin. The Rev. Canon Michael Durning, Class of 1987 and a member of our Alumni Executive Committee, will be joining the Bishop’s staff of the Diocese of Oklahoma as Canon to the Ordinary on April 15th, 2019. Durning brings 30 years of ministry experience to the diocese during a time of transition. Prior to his 2018 retirement, Durning served for 21 years as Canon to the Ordinary in the Diocese of Southwest Florida. His roles have included Diocesan Transitions Minister and staff resource for the ordination/discernment process. Over the past 30 years, he has had parish assignments in Naples, Marco Island and Longboat Key, Florida. Prior to ordination, he worked in the publishing business as an Art Director and Book Designer. Durning and his spouse Bonnie Jean have been married over 45 years. They have three children and three grandchildren.